Den 2 Wolves are joining the Den 1 Bears at the Musser Fall Fest on October 19. This is a great opportunity to have fun, learn skills, and earn electives! Please RSVP your attendance to Pete or Maria. Did you know? For your convenience, you can sync the Den 2 and Pack 99 calendars to your own calendar. Click the "+google calendar" link just below the calendar displayed here on the Pack 99 website. 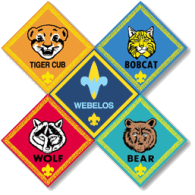 We have planned a fun year of Scouting activities for the Wolves to learn and grow together. It's going to be full of memorable experiences! Maria and I look forward to working with you this year! As your Tigers approach the final months of a successful first year, we still have lots of fun activities planned so be sure to check the calendar. Did you know you can sync the Scouts calendar to your device? Click the "+google calendar" link just below the calendar displayed here on the Pack 99 website.